Chinook's pass — Paolo M. Mottola Jr. Since we moved into the Oakes Tree, Amanda has pleaded for a dog. She puts on her best puppy-dog face from time to time and howls about how sad she is that she doesn't have one -- even though she cares for two large dogs at work. She looks at Petfinder for hours in the evenings, frequently calling me over to look at the next cutest puppy she found. I admit, our home was designed for a dog. We have chain link fence around the property and plenty of space for a dog to run. We have a mud room where a dog door could be installed and an old-enough house that if a dog went on a rampage, you wouldn't care so much because it'd add to the "character" (imperfections) of the home. I don't oppose the idea, but the timing isn't right. On Mother's Day, we were out working in the yard and noticed our neighbors had a Husky mix tied to a tree. We knew they had two Pugs but didn't know about the Husky. We walked across the street to inquire, and they told us they found the runaway wandering the neighborhood earlier in the day. They had to keep her outside because she didn't get along with their Pugs. The Husky had tags but was too fidgety to allow them to read. Amanda was some kind of dog whisperer and had no problem calming the dog, loosening its tangled harness and reading the tags. 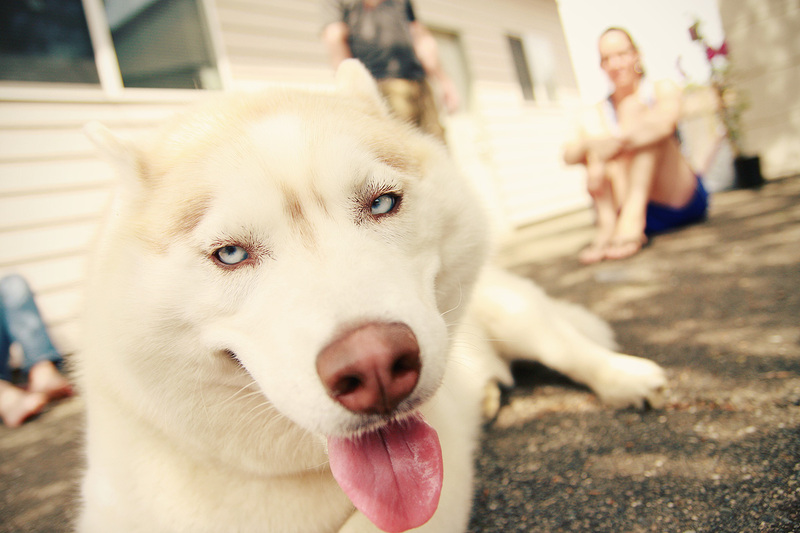 Her name was Chinook and her owners lived just a couple blocks away. Our neighbors went to the owners' house but they weren't there. We offered to take the dog in the meantime and relieve our neighbors. They gladly accepted and Amanda was pleased to play Mom to Chinook on Mother's Day. I watched the Sounders game with the boys while Amanda kept to the yard and played with Chinook. The dog had a good couple runs around the house, destroying 5 percent of our plants, but was out of shape and quick to lay down for the remainder of her stay with us. We kept her outside, and I enjoyed her company while I barbecued at halftime. Shortly after the game ended (What was up with the refs?) our neighbors called to tell us that Chinook's owners would be by to pick her up. Amanda hopes that the owners died in the previous hours vanished and she moved on to plotting how she could steal Chinook in coming weeks. The owners came to pick up Chinook and Amanda's Mother's Day came to an end. The next day, Amanda picked me up from the train station after work and we talked about how nice it was having Chinook around. Amanda kept saying how much she loved Chinook. The dog won over as much of her love in hours as I had in months. As if it were a sign, we saw Chinook on our way home. She had again escaped and we walked her back into her yard. Amanda suffered postpartum depression for the remainder of the evening. Fortunately, Mom is out of town for two weeks and Amanda can have her fix taking care of her mini-Schnauzer, Simon. I thought that taking care of these dogs would steer us away from getting a dog anytime soon, but I'm afraid that I'm wrong. For now, we're willing dogsitters.